A Happy Christmas : not from the Balkans but from News From Nowhere. The Christmas rush has already started and I am not sure that I will get too many opportunities to post to the Blog over the next few days. So I would like to take this opportunity to wish you all a wonderful Christmas and a delightful New Year. The postcard comes from my collection and dates from 1917 when it was sent by a member of the Survey Company of the Royal Engineers to a Mr and Mrs Bailey of Godstone Road, Rotherham. 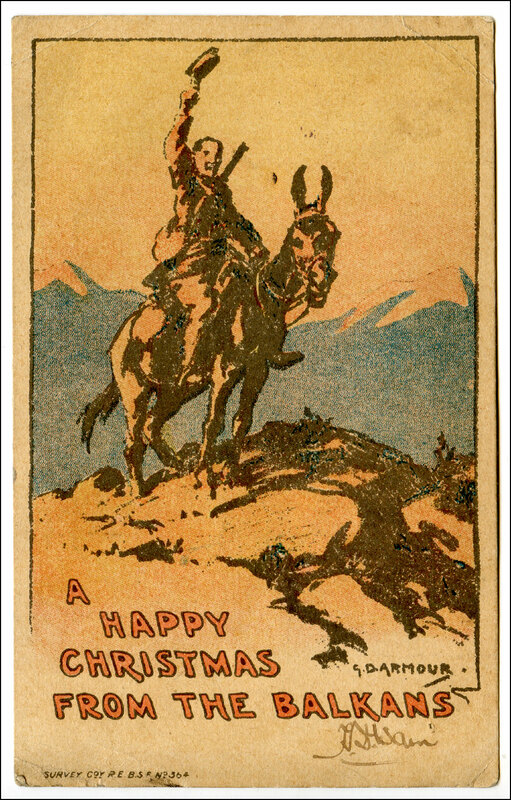 There is no message other than the general greeting on the front of the card : but what further greeting could you want. A Happy Christmas to you all. The link between my Sepia Saturday image this week and the theme image may be a tenuous one, but there is a solidity about it which could prop up a broken table leg. 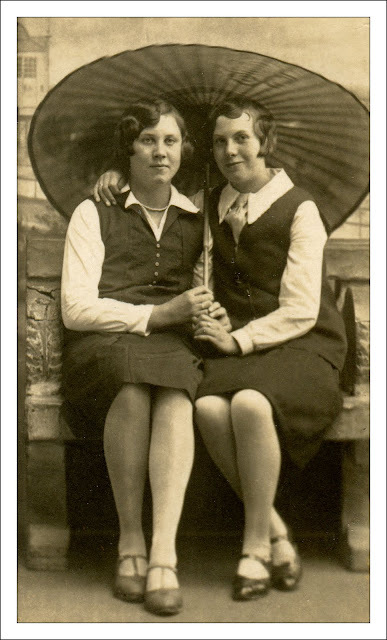 The picture shows my mother, Gladys (right), along with her friend, whose name I cannot recall. It was taken whilst the were on holiday in Cleethorpes in about 1929 or 1930 : the same holiday, I believe, during which she met my father. And it was taken round about the same time that she entered a competition organised by the local Bradford newspaper - the Telegraph and Argus - to find Bradford's "Perfect Little Housewife". I am not sure what she had to do - judging by the mores of the times it was probably bake a cake, indulge in a little damp dusting and press a straight crease in a pair of trousers - but whatever it was, she won the competition. And the prize was a copy of Mrs Beeton's Complete Book of Household Management. I am not sure what happened to the book - could it have found its way to Dominica? - but during my childhood I remember the block sized volume standing beside the two or three other books that made up the household library. And the link? The Sepia Saturday prompt was an illustration from a 1901 edition of Mrs Beeton's Cookery book. I can never think of Mrs Beeton without thinking of the young Gladys Beanland - Bradford,s perfect little housewife. Perhaps I can briefly follow up on a couple of comments on my last post. Both Michael & Hanne and the inimitable Chairman Bill referred to the number of hats on show in the picture of Neville Chamberlain arriving at Heston Airport. CB actually said that "you wouldn't find a single hat in a similar photo of today". I have to say that if you had been at Manchester Airport at 11.00pm last Monday when my plane from Munich arrived (by the way, Martin, it took about two hours by comparison) you would have seen one hat on show - mine! I am a serial hat wearer and have been most of my life. My photograph shows me this morning about to take Amy out for a walk and wearing the Fedora (*) I bought in Munich. I apologise for my slightly startled look and for the imperfect quality of the shot as Dr Johnson might have said : "Sir, a dog taking a photograph is rather like a woman preaching. It is not done well; but you are surprised to find it done at all." I bought the hat in a Munich Department Store (they had an excellent selection of hats available) and I was attracted to it by its claim to be "crushable". The claim was tested during my return journey when I consigned the hat to the overhead luggage locker (it is rude to wear your hat whilst being served a can of beer and a bag of crisps by the stewardess), and a fellow traveler dumped an enormous case on top of it. As you can see, it emerged rather well from the experience. 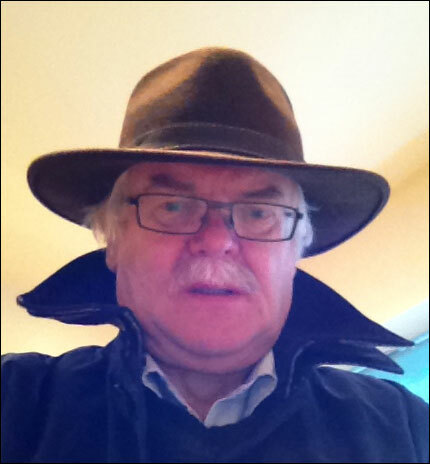 (*) I realise that I might be sparking a new debate in calling my hat a Fedora. The brim is too large for it to be a Trilby and it has neither the shape nor the ruggedness of a Stetson, but one might be tempted to think of it as a Homburg. My own feeling is that it has neither the stiffness nor the central gutter of the typical Homburg. Peace For Our Time : But What Time? All sorts of things go through your mind when you are flying back from Munich and the air turbulence is so bad that the Stewardess can't serve you your can of beer and bag of crisps because she is firmly strapped into her seat and doing some last minute revision on the emergency evacuation procedures. 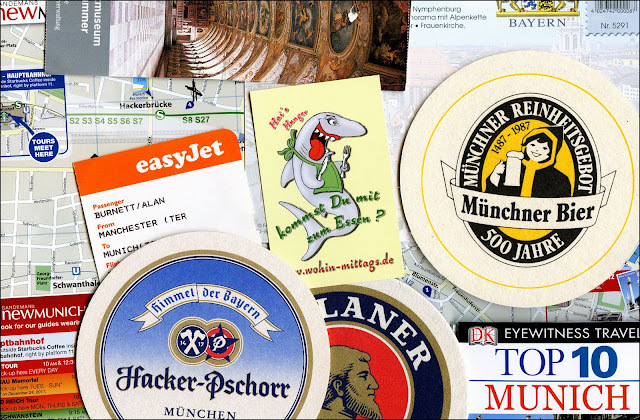 My mind turned to that most famous return flight from Munich, the one undertaken by British Prime Minister Neville Chamberlain on the 30th September 1938, and I became obsessed with discovering how long the journey took him. Why such ridiculous questions should have dominated my mind at a time when the difference between life and death seemed to rest on the strength of the rivets holding the wing to the Airbus I was flying in, I have no idea, but on my safe return to Britain, I was determined to discover the answer. 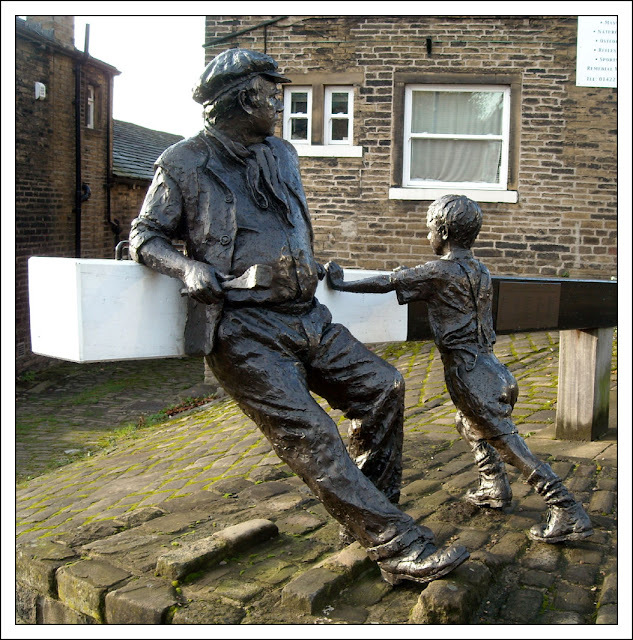 There is a lot of information available about that famous return journey. Chamberlain was returning with a meeting with Hitler, Mussolini, and Prime Minister Édouard Daladier of France : a meeting at which the future fate of Czechoslovakia had been decided (without the active participation of the Czech Government). 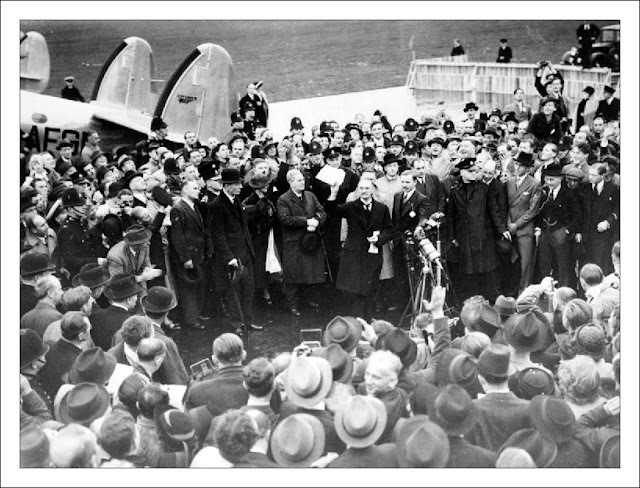 On his return to Heston Aerodrome, Chamberlain waved his famous piece of paper and spoke of peace. Later that day, in Downing Street, he issued his famous promise of "peace for our time". We know what kind of plane he flew in (a Lockheed 14 with the registration number G-AFGN), we even know Chamberlain's ticket number (BA/WS 18249 : the actual ticket was re-discovered about a year ago). But how long did the flight take? 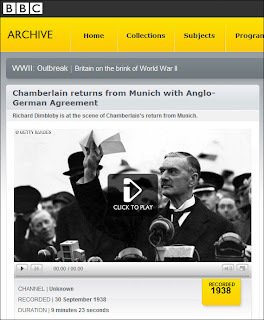 I eventually found the answer within an archive recording from the BBC. The clip is from the original report made as the plane landed at Heston and features the sonorous tones of the famous reporter, Richard Dimbleby. Near the beginning of the broadcast, Dimbleby comments on the poor weather in England but says that the Prime Minister had good weather for most of the return flight which took "something like three and a half hours - a little less than that actually". You can find the full nine minute broadcast from September 1938 on the BBC Archive website - it makes interesting, but poignant, listening. 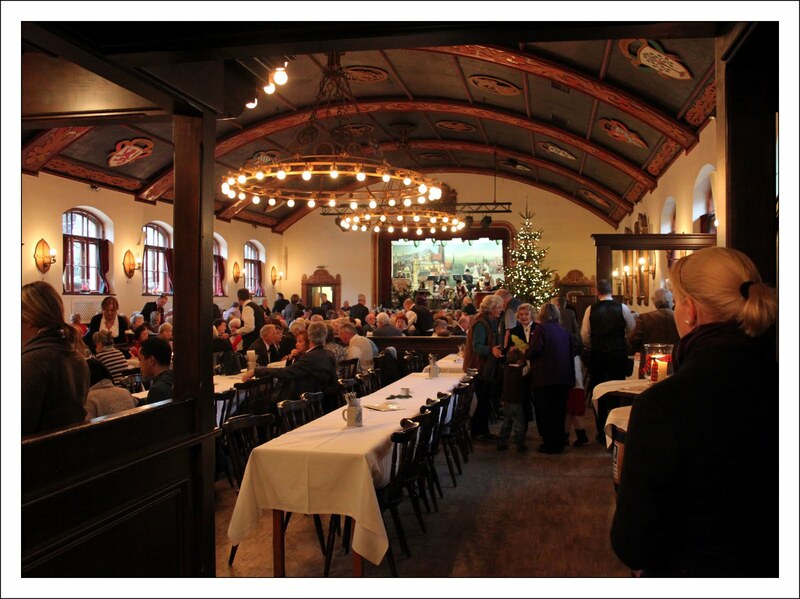 We are back from Munich after a delightful few days : days that were bookended between Christmas Markets and Bier Kellers. The weather wasn't perfect, but the sights of the city were. We came back to a long list of outstanding Christmas jobs : so postings may be a little intermittent during the next few days. But when the list of jobs is too long, the cold wind too cold, and the endless Christmas card list is too endless - we shall always have Munich. You can't beat the occasions when someone you know passes you a computer disk or a stack of papers and says "I thought you might like this for the blog". 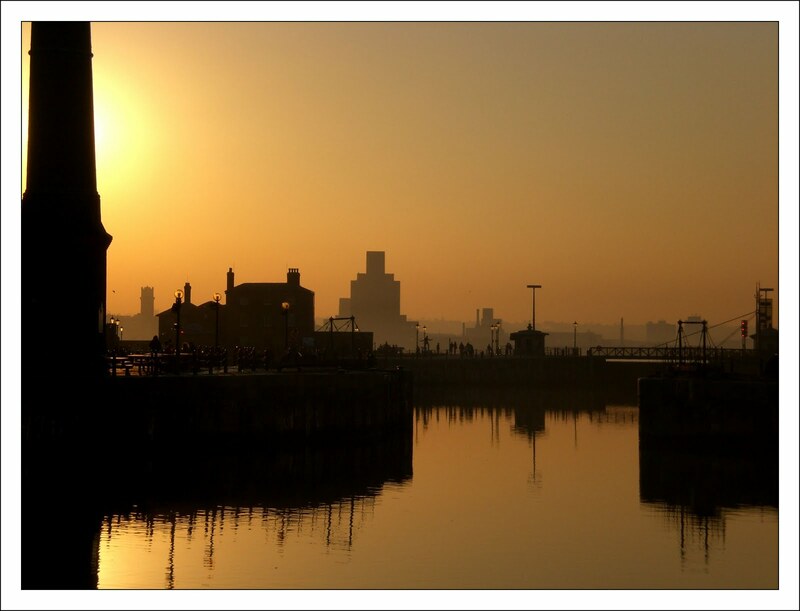 It was a computer disk which was handed to me at the pub the other evening by my good friend Denis : and on it I discovered six fabulous images of a sunset at the Albert Docks, Liverpool. I spoke to Denis later and he told me that the pictures were not planned, he just spotted the spectacular sunset one evening and captured them with a small pocket digital camera. The filenames underline this relaxed approach : they are simply called Liverpoolsnap1, Liverpoolsnap2 etc. It is a pleasure for the blog to be used to feature such great photography. This is my last post for a week as we are about to leave for a few days in Munich. 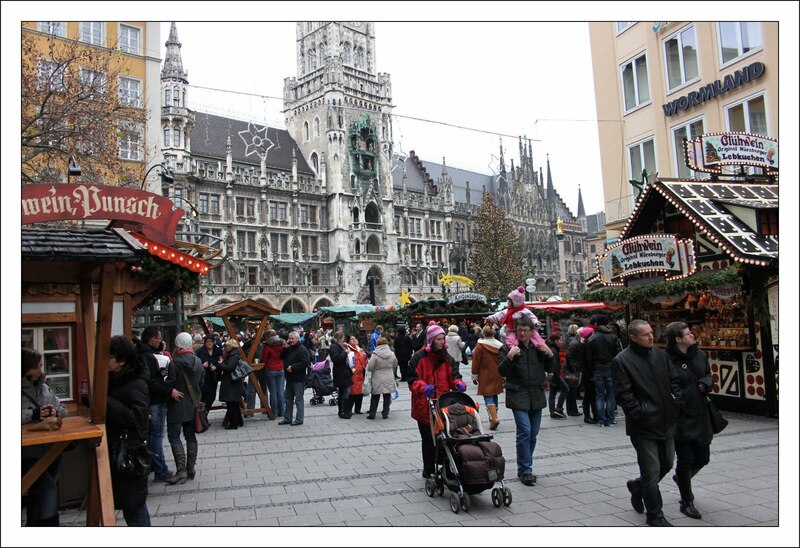 The GLW has always wanted to visit a German Christmas Market and I am hoping that in addition to markets such as this, we will have time to visit some of the stunning museums and sample some of the magnificent architecture of the Bavarian city. To keep you occupied in my absence, I thought I would leave you with a little competition. At the end of this post you will find a scan of our answer paper from last Fridays' quiz. Given the answers, your task is to work out what the questions were! This, of course, is a doubly complex jeopardy because - as you can clearly see - several of our answers were wrong! 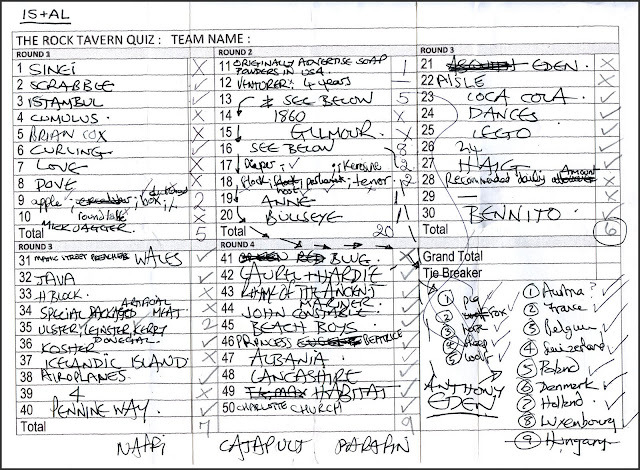 Denis - of Liverpool sunset fame - is banned from this competition as he set most of the questions. See you all next week. Our Sepia Saturday prompt this week has a medical element to it - it is a 1960s picture of a nurse in Richmond, Virginia about to go out on calls. The only medic I have to match the theme is the Good Lady Wife and therefore my picture this week dates back to 1983. 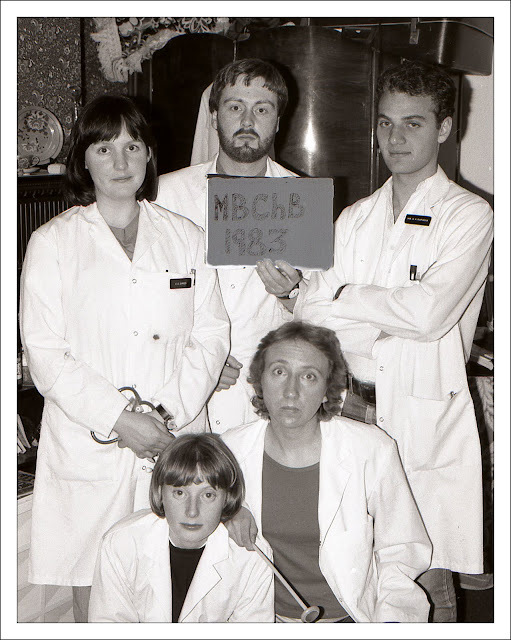 It shows the GLW and a group of her colleagues just before their final exams. The photograph followed a clinical skills revision session and in order to obtain a suitable record of the event I persuaded them all to look miserable for the occasion. If anyone should have been miserable it was the poor chap behind the camera (me) because, as well as being the session photographer, I was also one of the session guinea pigs. It had been decided that I had particularly good varicose veins and therefore they were made available for examination. My poor old father - who seemingly had a wonderful heart murmur - was also roped in for the event. As well as being on-theme, the photograph has a particularly timely connection. The students went on to graduate and eventually became doctors. 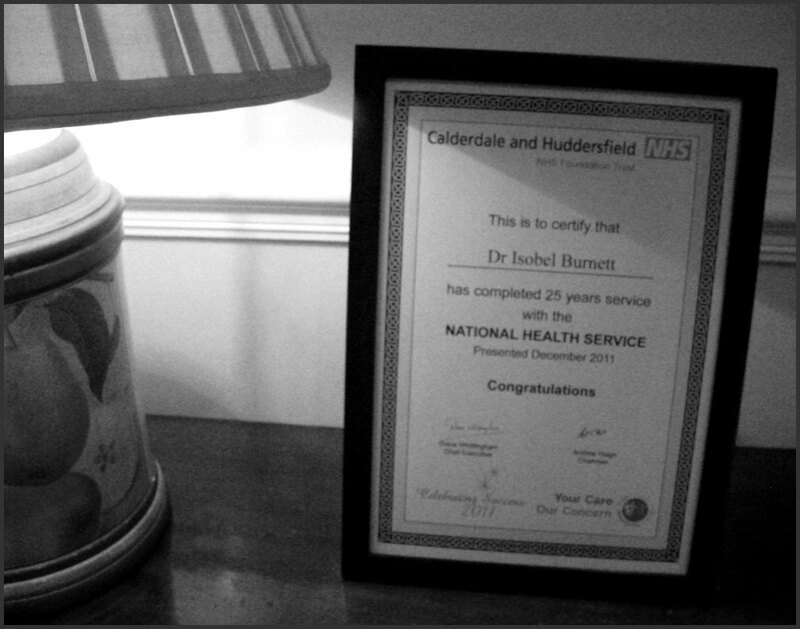 And on Thursday evening, the GLW and I went to a presentation evening organised by the Local Hospital Trust where she was presented with her 25 year service certificate. Whilst the doctors made it to 25 years, my varicose veins didn't - they were removed many years ago. I still have the scars from the operations : they serve to remind me of the passage of time. As do the photographs. To see more Sepia Saturday 103 posts visit the SEPIA SATURDAY BLOG and follow the various links. If you have been following the on-line fraternal battle between the Burnett Boys this week, you will know what to expect. It all started when I published a recent picture of Halifax Market last Sunday. On his Sculpture Studio Blog, my brother responded by publishing a sketch of the same market he had done a number of years ago. Not to be beaten, I then published a photograph of the same scene I had taken some 45 years ago. With that, I should have won : but could my brother leave it there and accept defeat, no way. 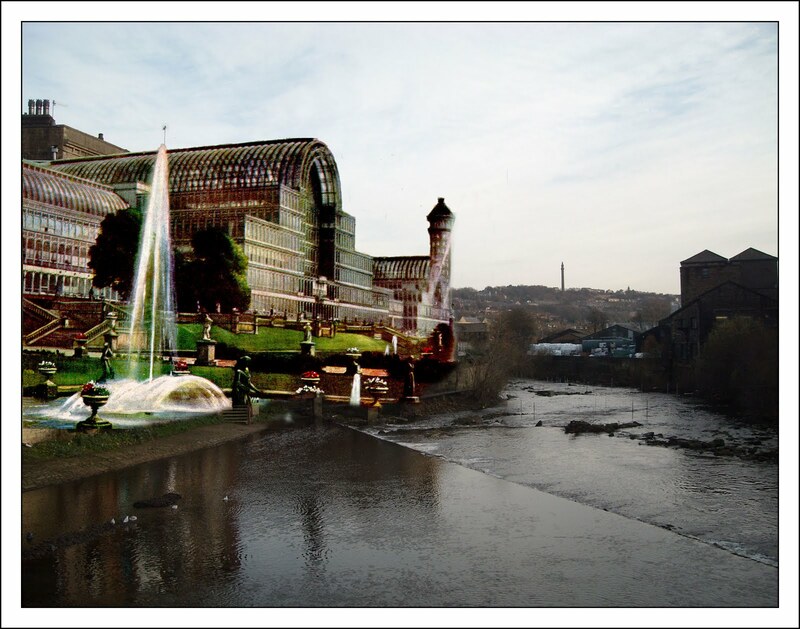 So he then published a post describing how he had conceived a plan to move the town of Sowerby Bridge in order to avoid a busy road and how he had designed a new market - a kind of "linear Crystal Palace" - to occupy the newly opened river bank. He ended the post with the following words: "Now dear brother, if you can come up with a compilation photograph to illustrate my scheme, you’ve won!" So, no guessing where I was this morning - and here is the result. You see, dear boy, the photographer can always beat the conceptual artist - we have the ability to translate vague ideas into reality. As a final example of my point, as I wandered around those back streets of Sowerby Bridge I came across a bronze statue. Very pleasant in its own way, but how much better as a two-dimensional photograph.